My 2018 AP Chemistry Released Exam Draft Answers & Comments appear below. The questions are here. These are DRAFT answers and may change as errors are pointed out to me, and other thoughts come to my mind. Should you find an error PLEASE let me know by commenting on this post below, rather than emailing me or using the contact form me (that way all problems can be addressed in this post), and I will comment/change as necessary. PLEASE NOTE: Any of my comments below about how your individual answers might be graded, are highly speculative – you should not take them as fact. (e)(ii) Will cause issues in terms of moles of reaction. I HATE this concept, and this is a good example of why. (a) I don’t get the obsession with particulate diagrams, I’m not really sure what they add to the course. (d)(i) This Lewis diagram ‘fill in’ question around the skeleton is too easy IMO. I think this should be made more challenging. (f) Obsession over this ‘how the ratio of base to acid makes pH either smaller or larger than pKa’, business. Why? (a) Although I have no issue with this question myself, many people have commented on how this might cause issues in terms of the excluded Aufbau exceptions. Honestly, I don’t think that it does, BUT it would be smarter for the TDC to steer away from such potential issues IMO. (c) I SO wish it were still necessary to construct these complex REDOX equations. (b) My advice? DON’T neglect ‘x’, here! (a) This may be the first time the SPECIFIC role of the salt bridge has been asked (at least in a contemporary question and from memory). I wonder what might be acceptable here. (b)(iii) Asks for the answer in J, and you’d think that kJ would be marked ‘wrong’ because of that, BUT on a recent exam a similar thing was asked and either was accepted. What gives? How would you compare the difficulty of this questions with last years FRQ? It really is very hard to say. I think these questions are fairly straightforward, but you can bet there’s a TON of places that students will miss points. I feel like this year’s exam was quite a bit easier than past year’s exams (especially exams prior to the redesign). Even compared to exams post-redesign, this year’s exam seemed far more straight forward and basic than the 2015 or 2016 exam. A question to go along with this… If this exam does turn out to be easier for students and the national average scores increase, will the college board shift the curve for passing upward or will they allow there to be an increased level of passing (>3) scores? The exam is criterion referenced meaning that no matter how many people reach a particular standard, they can ALL be awarded that score. HOWEVER, the grade boundaries move, and are set each year, so in reality it’s likely that the number of students in each band grade will remain somewhat comparable from year to year. Your answer for 3i is incomplete because FeO having a lower molar mass than Fe2O3 in and of itself does not mean the moles of Fe would be too low, because for Fe2O3 we also multiply by a 2 Fe : 1 Fe2O3 ratio whereas for FeO the ratio is 1:1. It would be more apt to talk about the mass percent of Fe in FeO being larger than the mass percent of Fe in Fe2O3. (Counterexample: the putative FeO2 has a lower molar mass than Fe2O3, yet the calculated moles and mass of Fe would be too high if FeO2 were an unconsidered impurity). Point taken, BUT I didn’t only say ‘lower molar mass’, I also went on to talk about how that would affect the number of moles calculated. However, I think that your suggestion regarding a different way to describe this is likely better. I’ve amended my answer. question#3 (i); some of the product is FeO and not Fe2O3. The mass % of iron in FeO is greater than Fe2O3; therefore more iron would be calculated. But the calculation is based on the (in the scenario painted, incorrect) assumption that ALL is Fe2O3, so because of what you say, the Fe % calculated will be too low. 3a is asking for the electron configuration of the Fe+2 ion. the configuration you used was Fe. It should be 3p4, right? No, 4s electrons are lost first. This is a small thing, but the numbering for questions 2-7 are 2017 instead of 2018. Can you change that for OCD people like me? For #3d, would it be incorrect to have coefficients of 5 on each term in the equation? (5Fe2+ -> 5Fe3+ + 5e-)? Thanks! For 6bi, should the E for the chromium half-reaction should be labeled as E_reduction instead of E_oxidation, since the requested reaction shows electrons in the reactants? I’m showing the reduction potential for the “oxidized” half-reaction! Thanks for posting your answers, Adrian. My first thoughts were similar to what some others have already posted, which is this exam seems easier compared to previous years (this is my fifth year teaching the course). But “easier” is right. I like “more straightforward.” Less reading overall for the students. It could also be that I’m getting better at/more comfortable with teaching the class. Overall, I feel the questions do a good job of assessing chemistry and nothing else (i.e. reading skills). Admittedly, I would have lost a few points for stupid errors. For example, #3 (g), I accidentally calculated grams when the question asked for moles. Whoops! My students had two different versions of the exam, an “E” and “O” versions. Do you know if the other version will be posted? My students told me the other version was much more difficult. Unless it happens to be the one that is released as a practice exam in the fall, you will never see it! Thanks for the quick reply! How will those students be assessed? I assume there were enough of them administered to make separate grading curve? Separate grading process altogether, yes. Absolutely! 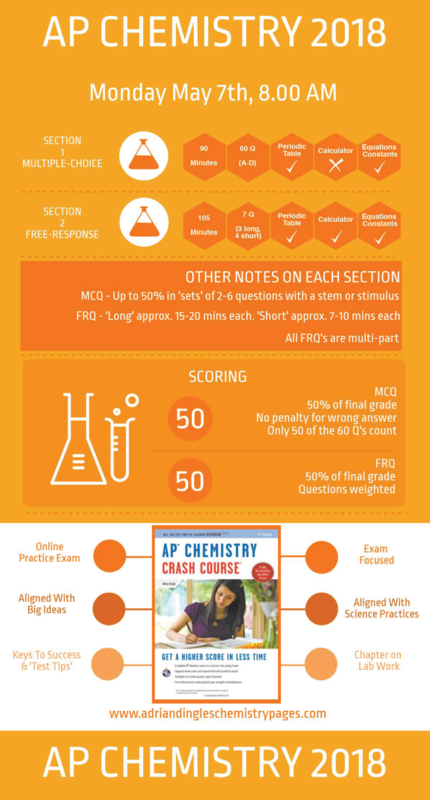 All, relevant and correct chemistry that answers the question will score full credit. Thanks for your answer key – largely in agreement with mine. In General I think the exam is very easy. The only problems that I thought would be challenging were kJ/mol-rxn as you mentioned in Q1. Also, the error analysis in part (i) of Q3. Almost every one of my students were in agreement that this exam was way easier than the IPE exams or the 2013 practice exam that we completed in class. Yet – I agree some students will make silly mistakes. In 5(c) I prefer the answer: Increase, because equilibrium shifts to side with more moles, according to LeChatelier’s principle, trying to counter the dilution effect by creating more moles (i.e. relieving stress). In 4(b), I think they could make the gas law problem more challenging. Futhermore, in (a), they should guide the students to include IMFs for both species in their explanation. 1(g) – the net ionic equations need to be way more challenging. 2(d)(I) Lewis structures need to be more challenging as well. I think I remember Adrian saying that the College Board has emphasized incorporating a discussion of the reaction quotient when there are stresses applied on the system. In the past, I would say that adding water (a pure liquid) would favor the side with more aqueous species. However, using the reaction quotient seem to be a better way to do this as it would explain the shifts behind Le Chatelier’s principle. The free response from 2016 (#6) also had the reaction quotient discussion, so I thought it wouldn’t hurt to have my class learn this. Mr. Dingles for the boiling point question, I mentioned all those explanation (polarizability and dipole moments) but ended my sentence, thus it has stronger intermolecular force. I might have forgot to connect the boiling points with stronger intermolecular forces. Do you think that they would deduct points? Also, would it be okay to state that although COS has a weak dipole dipole, the LDF is dominant over it? It’s really the idea that the collective LDF’s in the molecule with greater electrons/surface area outweigh the dipole-dipole IMF’s. Again, without reading your actual answer it’s difficult to tell. Without reading your answer in its entirety, it’s difficult to tell, but the essence is, were all the IMF’s identified, and were their relative strengths linked to boiling points? all the IMF were identified. However, I am not sure if I connected the relative strength to the boiling points. However, I did state the CS2 have a higher intermolecular strength. Is it enough to just say that the volumetric flask only has one marking so it would be inaccurate? Also, I accidentally drew two lewis dots since HNO2 does have a stable structure and a less stable one. I drew them both on the lined paper. Will that harm my score? For the volumetric flask, I think it’s going to depend on your actual answer. The same is true of any erroneous Lewis structures. It’s possible that they may be ignored. For question 2(e)(i), if I started using the value of pKa and finding Ka to find initial concentration of HNO2, would that work as I did not use VM=VM. First, thanks for your useful answers. They helped me spot my mistakes. Again, thanks for preparing these answers. There will certainly be no requirement to identify 3.3 as the EXACT pH reading. Whenever students are asked to read from or interpret a graph, unless there is some absolute and obvious scale, then there is always a range of values accepted. Thanks for picking up my omitting “half”, I have now corrected that. Is it possible that you estimate how many points each part worth? 10 points each for Q1, 2 and 3, and then 4 points each for Q4-7. You can probably assign the points fairly easily. Total is out of 46, multiplied by a factor to make it out of 50.
thank you. For question part e part ii if I divided 750 J by (0.0025 moles /4 ) and got -1200 kj/mol, would that be fine? I showed this work when i was deteriming the limiting reactant in part c. Thus, I knew that i had to divide by 0.000625. Are the 10 field questions the hardest problems that don’t make sense or are they just random? No, they are ones that are used year after year, in order to compare one group of students to another. I agree: #5 b should have considered x. If ever there was a question that required the quadratic, it’s this one! And the heavy emphasis on % ionization??? CB couldn’t have been achieved with a multiple choice question instead? Ridiculous! Well x was given, so no quadratic! This exam is a joke compared to the US chemistry Olympiad. Different audiences, different goals, different exams. For question 2e(i) – can you use the pH from the graph (2.5) when 0 mL of KOH has been added and just use the formula [H+]=10^(-pH) to find the initial concentration of H+? In a word, yes. There is more than one way to solve that problem. But then that would give 2 different answers depending on which method you used to solve… would either be acceptable if you showed your work? No, it will give the same answer in each case. 10^(-2.5)=.00316M which is different from the .0200M answer that you get when you solve it they way you did… am I missing something? The 0.00316 M is the concentration of the H+ ion. After that you must go on to apply the Ka expression to calculate [HNO2], and therefore answer the question! Duh (I knew that)… Thanks so much for the responses! For question part e part ii if I divided 750 J by (0.0025 moles /4 ) and got -1200 kj/mol, I showed this work when i was deteriming the limiting reactant in part c. Thus, I knew that i had to divide by 0.000625. For the work, I just showed the division process. Would this be fine? Probably, but again, it will depend on exactly what it looks like on the paper! For #5 (c) I agree with your conclusion, but “diluting” H3O+ and F- equally seems a flawed methodology to me, as H3O+ is not a conserved value (i.e. you can’t apply dilution to it). Though I’m guessing CB will accept it as a justification, I think you should reassess [HF]total (0.0175 M) and work from there. I’m largely working off the CB/TDC obsession with Q versus. K! For question 1 a why is the oxidation number of Cl +1, instead of +2? for using G=-RTlnK, don’t you have to convert G to joules to match the units of the R constant? doing this will give a different answer. Yes, OR as I did, convert the constant by dividing by 1000.